I am not much of a candy eater myself and I don’t go crazy over chocolate, so I rarely have the occasion to actually make any candy. However, with Halloween just happening, there was a huge influx of candy recipes all over the place to take a look at. I saw a couple that actually interested me, including this one from Food Republic for some homemade peanut butter cups. This version does taste a lot like the famous Reese’s version that you have come to know and love for generations, with one important difference. This recipes is not for the kids as it does make use of some bourbon, albeit a small amount. Line a 12-cup muffin tin with paper liners. in a saucepan, add the shot of bourbon and the shortening to the chocolate chips and place over very low heat. Stir the ingredients until the mixture becomes very smooth. Make sure to add the alcohol to the chocolate when the chocolate is still solid, as adding liquid to already melted chocolate will make it seize up. Allow the mixture to cool slightly, but make sure the mixture is still pourable. Spoon 1 tablespoon of the chocolate inside the paper cups, covering the bottom half of each cup. Chill the chocolate for 30 minutes, or until cool. In a bowl, combine the confectioners’ sugar, peanut butter, salt and butter until it is well incorporated. Spoon 2 heaped tablespoons of the peanut butter mixture over the chocolate cups and press down firmly to smooth the peanut butter layer. Spoon another tablespoon of the melted chocolate mixture over the top of the peanut butter, allowing the chocolate to completely cover the peanut butter layer. If the chocolate mixture is cold and no longer pourable, return the saucepan to the stove over low heat for 1 minute until it is smooth and pourable again. 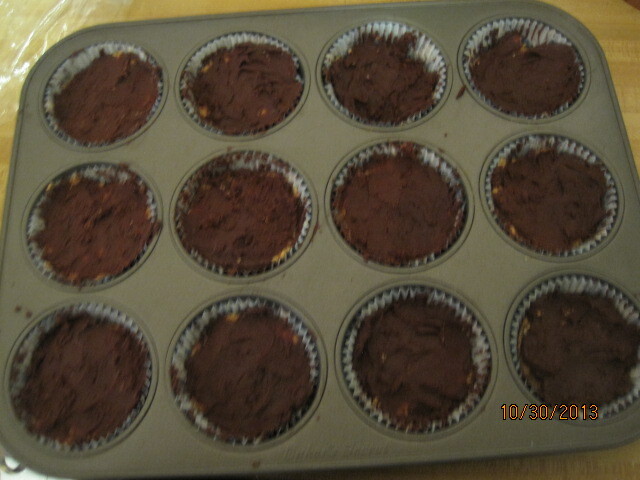 Chill the peanut butter cups for 3 hours or until firm. I have to say that this recipe does taste just like a Reese’s peanut butter cup but the bourbon adds a really nice flavor to the entire mix. The recipe makes 12 rather large peanut butter cups and I think you could easily make many small ones on a parchment paper-lined baking sheet if you wanted smaller ones. The one catch is that the paper liners for the muffin tins help to give a nice shape to the candy, which you would lose if you did them free-form. In either case, it is a very easy treat to make that might be great for a party or if you are making some things for a homemade gift basket for the holidays. Most of the time for the recipe is just chilling the candy so it sets well. That’s all I have for today. Check back again for some more great recipes. There’s still lots more to come as I am trying new things all the time. Until then, enjoy the rest of your day and enjoy your meal!